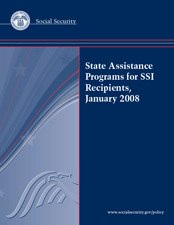 This report provides data on selected characteristics of state assistance programs for Supplemental Security Income (SSI) recipients as of January 1, 2008. The data the Social Security Administration (SSA) uses to compile this annual report are provided by the states where the state administers the supplementation program. The data presented are what was made available at the time of publication.